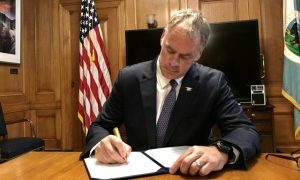 The Bureau of Land Management has a new acting director after Department of Interior Secretary Ryan Zinke tapped Brian Steed to take over. Steed, formerly chief of staff for Rep. Chris Stewart (R-Utah), will replace Mike Nedd, acting director for BLM since March. “The West is in good hands with Brian Steed, my former Chief of Staff, leading as Acting Director of the Bureau of Land Management. He knows these issues thoroughly and will have great success,” Stewart told Western Wire. “HUGE shoutout to my former chief of staff Brian Steed, the new acting director of the BLM. He’s going to do such a great job. Huge for Utah. Huge for the West. Proud to call him a friend,” Stewart tweeted. “His experience includes working as Chief of Staff to U.S. Representative Chris Stewart of Utah, teaching and researching economics at the University of Utah, and serving as a Deputy County Attorney in Iron County, Utah,” Nedd wrote. Steed served Stewart as his chief of staff since 2013. Rep. Rob Bishop (R-Utah), Chairman of the House Committee on Natural Resources, praised Steed’s expertise. While other objectives in making wilderness designations—such as political or conservation—are met, such designations “economically disadvantage those communities,” and more attention should be paid to the “interests of local communities” the authors suggested. “Our findings suggest that claims that wilderness also promotes economic growth are unfounded,” they wrote. Nedd, who will become acting deputy director for operations at BLM, declared confidence in the BLM’s leadership. President Trump still has to nominate a permanent BLM director, but it isn’t clear when that decision will occur.